This page carries news from the wider Church and comment from the rector. Click > at the end of each story for earlier reports, or < for later ones. It is with deep shock and indignation that World Council of Churches (WCC) received the news that 49 people have been killed and at least 20 were wounded in terrorist attacks at the Al Noor mosque in Christchurch and at the mosque in the suburb of Linwood in New Zealand. Dr Tveit expressed his deep condolences to the Muslim community, and all the people of Aotearoa New Zealand, for this massacre is an attack on the whole nation and its values of inclusion and respect for all its citizens. He added: “We pray that all the communities of Aotearoa New Zealand will come together to support those who have suffered so dreadfully and to reaffirm the nation’s commitment to the safety and flourishing of all its people”. World Council of Churches (WCC) member churches across the globe are participating in a campaign to end violence in schools, an effort that is part of a larger partnership, called “Churches’ Commitments to Children,” between the WCC and UNICEF. The #ENDviolence campaign resulted from a September 2018 report, “An Everyday Lesson: #ENDviolence in Schools,” showing that half of the world’s teenagers experience peer violence in and around school. UNICEF also launched an online poll aimed at 13 to 24-year-olds that gave young people the option to share their views online. Those views helped shape an #ENDviolence Youth Manifesto, completed in December 2018, which will be delivered to education ministers and other decision-makers at critical milestones throughout 2019. WCC member churches in Mozambique, Germany, Jamaica, South India, Philippines, Nigeria, Uruguay, South Africa, Chile, Kenya and the Democratic Republic of Congo participated in the online poll as well as in workshops with youth that helped contribute their reflections to the manifesto. One million young people responded to the global poll, and 69% of them said that they had been afraid of violence in or around their school. In the responses, 24,000 youth provided comments emphasizing the need to take students’ concerns seriously and recommending ways to make schools safer. A delegation of churches in Europe met in Bucharest on 28 January with Teodor-Viorel Meleșcanu, Minister of Foreign Affairs of Romania, to exchange views on the priorities of the Romanian Presidency of the EU Council. The Christmas message of the Light coming into our darkness brings us our ultimate hope, for it is the Lord Jesus Christ who remains the hope of the world. No matter how dark our world might be, the Gospel reminds us, “The light shines in the darkness, and the darkness has not overcome it.” (John 1:5). At the start of this New Year, may we put our trust in Him – as we look to Him in simple faith and in His name seek to bring hope and light to our local community and to this our island home. The Archbishop of Canterbury, Justin Welby, and the leader of the Protestant Church in Germany, Bishop Heinrich Bedford-Strohm, have issued an urgent appeal “to all politicians to find fair and sustainable solutions for the future coexistence of the UK and the EU”. The Church leaders made their plea in a joint statement at a time when the British government and the European Commission are finalising a deal to revoke the UK’s membership of the European Union. Bishop Heinrich visited Lambeth Palace, the London offices and official residence of the Archbishops of Canterbury, for two days last month, during which the Church leaders drew up their joint statement. Most of the meeting will take place at the University of Kent in Canterbury. There will also be a programme day in London and two Lambeth Conference Eucharists at Canterbury Cathedral. A delegation of young adults from the Diocese of Lusaka helped a regional consultation on families under pressure to “revisit our thinking about the place of young people in our families, communities and churches”. Each of the 15 dioceses in the Church of the Province of Central Africa sent one male and one female participant to the six-day consultation, which was organised by the International Anglican Family Network (IAFN). They were joined on one day by 26 young people from the Diocese of Lusaka, who challenged them to think about the tensions between “digitally native” young people and older BBCs – people Born Before Computers. The consultation, “Families under pressure: How can churches respond?” was a celebration of the family as a foundation for human flourishing and the place where Christians can build up resilience to cope with change and challenge in society. The participants looked at a number of issues, such as economic hardship, inter-generational poor parenting, substance abuse, child marriage, domestic abuse, and technology and the generation gap, which can put families under pressure. They shared information about what steps they are already taking in their dioceses to respond to these issues and reflected on what steps might be taken at diocesan and provincial levels to strengthen families in such a way that every member flourishes. “Consulting with youth challenged us to revisit our thinking about the place of young people in our families, communities and churches”, Canon Robert Sihubwa, the Provincial Youth Coordinator for Central Africa, said. “They reminded us that not all parents are good role models and sometimes the church is the only place they can run to. As the death toll from an earthquake and tsunami in Indonesia soared above 800 on Sunday 30 September, World Council of Churches general secretary Rev. Dr Olav Fykse Tveit urged all people of good will across the world to reach out in support, care, help and prayer to thousands of earthquake survivors coping with the aftermath. The 150th anniversary of the first printed edition of Te Paipera Tapu – the Bible in the Maori language – is being celebrated in New Zealand. The work that led to the Maori language Bible began years before-hand, when Anglican priest Samuel Marsden, working as a Church Missionary Society (CMS) worker in Sydney, was given permission to establish a mission in New Zealand. Edited versions of the scriptures – the books of Genesis, Exodus, Matthew and John – were printed in Sydney and shipped to New Zealand; before CMS arranged for a printing press and printer to be shipped to the islands from London. This resulted in the first ever book printed in New Zealand: a 16-page edition of Ephesians and Philippians in Maori, in 1835. Between 1836 and 1837, the press printed some 5,000 copies of the New Testament in Maori, before the first full Maori Bible was published in 1868. To mark the sesquicentennial anniversary, that first edition has been made available in digital form, “and this digitised version will be one of the many tools used to help produce a new translation in more contemporary language for today’s Te Reo Māori speakers,” the Bible Society in New Zealand said. Since that original 1868 edition, three further versions were published in 1889, 1925 and 1952. In 2012 the 1952 edition was published in a reformatted version. Calling Kofi Annan - who died on 18th August and was Secretary-General of the United Nations from 1997 to 2006 - a leader with hard-won wisdom and maturity in our time, the World Council of Churches (WCC) general secretary gave thanks to God for Annan's life, which he described as a gift to the United Nations and the whole world. “Our prayer is all that Annan stood for may become part and parcel of our global values for justice, peace and dignity for the whole humanity,” added Abuom. A rare medieval Bible has been returned to Canterbury Cathedral some 500 years after it was removed. 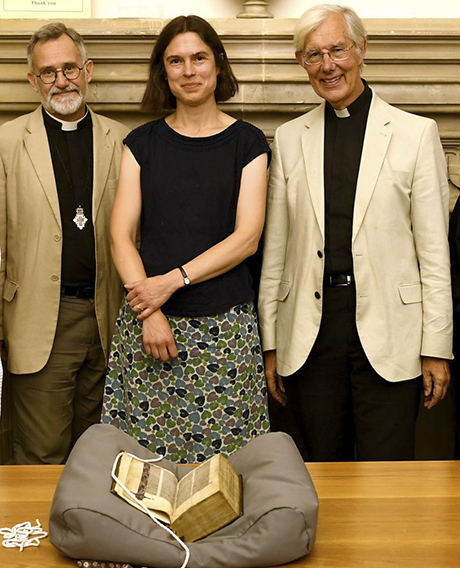 The Lyghfield Bible – named after the 16th Century monk who once owned it – was amongst a number of items removed from the cathedral’s monastic library at the time of the reformation. The monastic community at Canterbury was one of many which were dissolved on the orders of Henry VIII as he attempted to assert his authority over the newly independent Church and plunder its assets. The 690-leaf volume was purchased last month from a private seller at a specialist sale of manuscripts in London. The purchase was funded in part through a £96,000 grant from Britain’s National Heritage Memorial Fund (NHMF) and further funding from the Friends of the National Libraries, the Friends of Canterbury Cathedral and a private donation. The purchase of the Lyghfield Bible and its return to Canterbury Cathedral means that the rare manuscript will remain in the UK. “The Lyghfield Bible was written in the latter 13th century on high quality parchment or vellum which is almost tissue-like in quality,” Canterbury Cathedral said. “The fine Latin script and extensive and very fine illumination (decoration) was probably produced in Paris, one of the medieval centres for this type of work. The cathedral’s library and book collection were dispersed following the disbanding of the monastic community, with many volumes destroyed or taken apart for the reuse of their materials. Just 30 volumes of the original library remain at the cathedral. 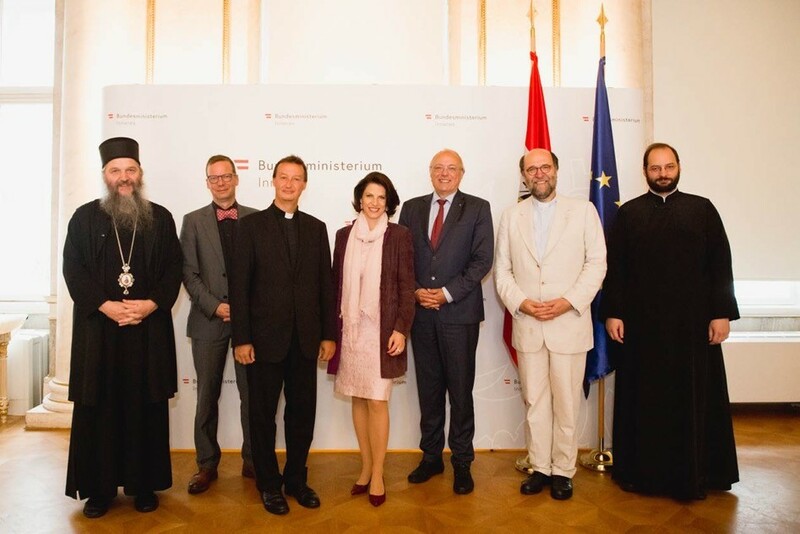 A delegation of Austrian and European church representatives met in Vienna on 23rd July with Karoline Edtstadler, Secretary of State for Home Affairs of the Austrian government, to exchange views on the priorities of the Austrian Presidency of the EU Council. Regular meetings of churches with the rotating EU Presidency have been taking place for more than 20 years. They are an expression of the regular dialogue between the EU and churches, religious, philosophical, and non-confessional organisations as established in Article 17 of the Treaty on the Functioning of the European Union. The starting point for this discussion was a working document entitled 'Austrian Presidency of the Council of the EU - Reflections and Recommendations of the Christian Churches in Europe'. In the field of migration and asylum policy, the delegation invited EU leaders to work for a Common European Asylum System, and to make it an appropriate tool to manage migration. All participants agreed that Europe is in need of migrants for obvious reasons. In this area, the church delegation presented to Secretary of State Edtstadler interesting proposals, such as “circular migration,” which should open up legal channels for low-skilled workers who meet the needs of receiving countries. They criticised the criminalisation of migrants and the poor respect for their fundamental rights, and called for their humane treatment in every phase of their journey, including when returning to the country of origin. A final topic addressed during the meeting was climate change and the upcoming COP 24 meeting in Katowice in December. Churches and church relief agencies are profoundly involved in this upcoming United Nations climate summit. The churches hope for a further strengthening of EU leadership in the UN climate negotiations and a leading role of the Presidency in preparing an EU contribution to the climate summit COP 24 in December in Katovice. Rev. Sören Lenz, Executive Secretary of the Conference of European Churches (CEC). 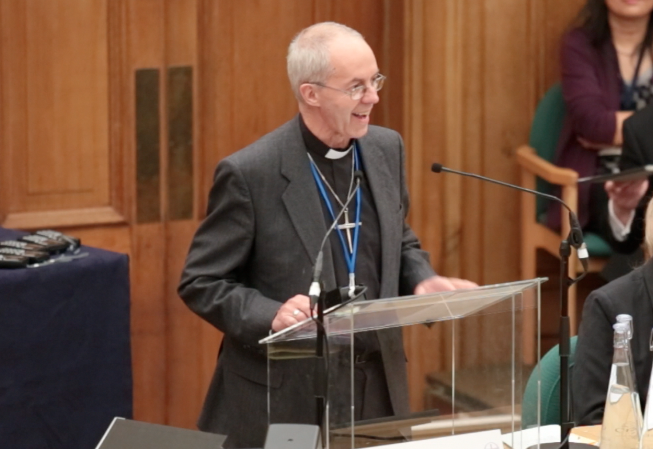 The General Synod of the Church of England has backed a motion calling on the Government to restate its commitment to the principles of nuclear arms control and eventual nuclear disarmament in a debate today at the General Synod. Members of the General Synod urged the Government to ‘respond positively’ to the UN Treaty on the Prohibition of Nuclear Weapons, by setting out its strategy for meeting its obligations under Article VI of the Nuclear Non-Proliferation Treaty. The Bishop of Chelmsford, Stephen Cottrell, told the General Synod that the motion was not about a ‘binary choice’ between unilateral or multilateral approaches but sought instead to give fresh impetus to the debate about nuclear disarmament. “What we are voting for this evening is a new national debate about the retention and development of nuclear weapons,” he said. “This is a complex and emotional subject, so please as you consider the rights and the wrongs of the nuclear deterrent, remember and pray for the men and women of the Naval Service who have for the past 50 years tried to keep our peace,” he said. The Bishop of Portsmouth, Christopher Foster, also paid tribute to the ‘tens of thousands of fine young men and women in all the Armed Forces, who put themselves in harm’s way to keep us safe’. The General Synod welcomed the 2017 UN Treaty on the Prohibition of Nuclear Weapons, and the ‘clear signal’ it sends that nuclear weapons are ‘both dangerous and unnecessary’. Members also backed work with Anglican Communion and other churches in addressing the reasons why Governments seek to acquire nuclear weapons and to efforts towards achieving a ‘genuine peace’ through their elimination. The motion has been passed after 122 states voted a year ago to adopt the UN Treaty on the Prohibition of Nuclear Weapons, with the Treaty thought likely to be approved later this year at the United Nations General Assembly. The Anglican Archbishop in Jerusalem, Suheil Dawani, has welcomed a visit by the Duke of Cambridge, Prince William, to the area, and the message of peace and harmony that he bought. Prince William completed his five day tour of Jordan, Israel and the Occupied Palestinian Territories yesterday morning (Thursday 28th June) in Jerusalem’s Old City, where he visited sites sacred to the three Abrahamic religions: the Haram al-Sharif, or Temple Mount, the Western Wall, and the Church of the Holy Sepulchre, where many Christians belief stands on the site of the crucifixion, burial and resurrection of Jesus Christ. The visit was the first official visit by a member of the UK’s royal family to Israel and the Occupied Palestinian Territories. The Greek Orthodox Patriarch of Jerusalem, Theophilos III, invited Archbishop Suheil to accompany Prince William on his tour of the Church of the Holy Sepulchre because of the links between the royal family and the Anglican Communion, through their close connection with the Church of England. His first official engagement in Israel was a visit to Yad Vashem, the international holocaust memorial centre, museum and school. Here the Prince took part in a simple but moving wreath laying ceremony before Britain’s Chief Rabbi, Ephraim Mirvis, recited the Jewish prayer for the dead – the El Malei Rachamim. He also met two survivors of the holocaust – two men who, as children, were put on specially chartered trains for Jewish children – the Kinder Transport – taking them to safety in the UK. “I believe that he did his best to accomplish a mission for peace and reconciliation; first of all amongst the governments – the Israeli and the Palestinian governments – and, I think, between different communities and religious communities here. Midwives from across Northern Ireland recently attended a special Choral Evensong in Belfast Cathedral, celebrating 100 years of the Midwives Act in Ireland. Midwives Acts across the UK were the birth of a regulated profession and established standards for education and training. Around 150 serving and retired midwives, family, friends and others connected to midwifery, attended the very happy Belfast Cathedral service. Organised by the Royal College of Midwives, it was one of a number of events celebrating this milestone in the history of midwifery and giving thanks for midwives everywhere. The latest edition of the Eco–Congregation Ireland newsletter highlights events, case studies and suggested activities to help parishes take a greater interest in the environment. This issue includes coverage of the Church and Society Commission’s seminar on climate change, environmental initiatives at General Synod, and an Eco–Congregation Ireland Award for the Roman Catholic and Church of Ireland parishes in Westport. Eco–Congregation Ireland is an initiative of the Irish Inter-Church Meeting, and includes members from the Roman Catholic Church, Church of Ireland, Presbyterian Church, Methodist Church and Religious Society of Friends. • By coming together to enjoy our ecumenical fellowship and to receive its richness as God’s gift to us. • By affirming that each person is created in the image and likeness of God and has inherent dignity as a result. • By being an intergenerational community, valuing the voices of young people who are our present and not only our future. • By practising solidarity with our brothers and sisters in Christ in Europe and beyond. • By urging individuals, institutions and churches to work for the end of violence, persecution and discrimination, upholding freedom of religion or belief. • By seeking reconciliation and the peaceful resolution of conflicts. • By standing with, empowering and listening to those who find themselves silenced or in the margins of our churches, our communities and our world. • By offering a generous welcome to refugees and strangers of all faiths or beliefs. • By engaging in dialogue, sharing our Christian faith and learning from each other. • By raising our voices to overcome division, exclusion and marginalisation and advocating human rights and socio-economic justice for all. • By recognising the hospitality given to us by God in the created world and by working towards the integrity of creation. The third gathering of the Global Christian Forum has called on Christians around the world to take up together the challenges of peace, unity and costly discipleship. The Forum connects the broadest range of global Christianity. Its third global gathering took place from 24-27 April in the Colombian capital Bogata. Some 251 church leaders from 55 nations took part in the event, representing almost all streams of global Christianity – including from the Anglican Communion. “Against the backdrop of growing division in the world, the ‘meeting itself became a message’ of careful listening and respectful engagement across barriers of old enmities and historic separations,” the World Council of Churches said. Anglicans present at the gathering included Bishop Francisco Duque-Gomez from Columbia; the former Bishop of Christchurch in New Zealand, Victoria Matthews; the Bishop of the Cape Coast in the Province of West Africa, Victor Atta Bafoe; and the suffragan Bishop of Toronto in Canada, Jenny Andison. Also present was the Archbishop of Canterbury’s ecumenical advisor, the Revd Dr Will Adam; the director of the Church of Ireland’s Theological Institute, the Revd Canon Dr Maurice Elliot; Dr Paulo Ueti, regional co-ordinator for the Anglican Alliance; and the Anglican Communion’s director of Unity, Faith and Order, the Revd Canon Dr John Gibaut. Other participants came from the Pontifical Council for Promoting Christian Unity, the Pentecostal World Fellowship, the World Council of Churches, the World Evangelical Alliance and many other Christian World Communions and international Christian organisations. “The existence of the Global Christian Forum as a place where churches and church leaders who are often strangers to each other to come together in ‘mutual love’ is a realisation of the shared yearning for healing in the wounded body of Christ,” the GCF’s secretary, the Revd Dr Larry Miller, said. Dr Miller said that GCF participants repeatedly affirmed the Forum as “an indispensable instrument for promoting Christian unity and engaging in conversation on the challenges Christian communities worldwide face today,” the WCC said. He said: “To hear in small groups the personal faith stories of high-ranking Christians from all confessions – a mark of the GCF – was moving and eye-opening. World Council of Churches (WCC) General Secretary, the Rev. Dr Olav Fykse Tveit, has condemned the suicide bombing attacks at three separate churches in Surabaya, East Java, Indonesia, last Sunday. Dr Tveit offered “heartfelt condolences to the people who lost family members and friends". He added, “It is shocking that this attack was directed against people who were gathered for worship, and that this attack comes on the heels of ongoing violence and persecution. In the face of this brutality, the human family, all people of faith and of good will, must stand together to recommit to respecting and caring for one another, to protecting one another, and to preventing such violence." He called for prayers, urging the WCC fellowship and others across the world to remain steadfast in their quest for peace and justice for Christians and all who are persecuted.